SAN FRANCISCO (Reuters) - EBay Inc is preparing to bring a major portion of its foreign earnings back into the United States, hoping to bankroll acquisitions and drive an expansion into mobile payments and other high-growth areas as its core business matures. Ebay, which on Tuesday forecast lower-than-expected earnings this quarter, also plans to ramp up its marketing spending on PayPal, which is an Internet leader but faces stiff competition in the fledgling smartphone payments market. The company took a $3 billion non-cash tax charge in the first quarter. 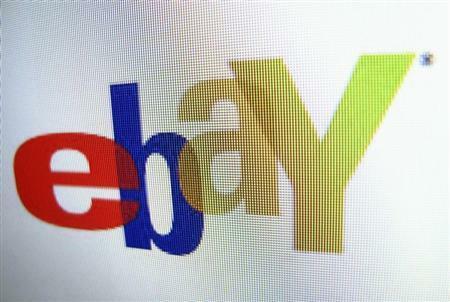 The move will allow eBay to boost its available U.S. cash by about $6 billion, when needed. It ended the first quarter with cash, cash equivalents and nonequity investments of $11.9 billion, though just $2.2 billion of that is in the United States. "If you look at our last 15 acquisitions, my guess is 10 have been inside the U.S., maybe 11," Chief Executive John Donahoe said in an interview. "Just looking at that versus where our cash is located, you just say, alright it would make more sense to have more cash in the U.S. for M&A." Shares of eBay fell about 4 percent to about $52.25 in after-hours trading despite posting a higher-than-expected first-quarter profit. Ebay's second-quarter profit outlook fell short of analyst estimates. The quarterly scorecard came a few weeks after activist investor Carl Icahn dropped his campaign to force eBay to spin out its most attractive division, PayPal. Icahn's push to carve off PayPal emerged in January, but he backed down after his efforts failed to gain the support of eBay investors. Donahoe said Icahn's campaign did not shape eBay's decision to repatriate foreign earnings to fund U.S. growth. The reality is we're seeing growing opportunities in the U.S.," Chief Financial Officer Bob Swan said during a call with analysts. "Additionally, we are an acquisitive company and we need to ensure we have the resources available to capitalize on targets that become available both domestically and abroad." EBay declined to say how it would use the extra cash in the United States, but Donahoe said eBay's approach to acquisitions would be consistent with years past. He pointed to last year's acquisition of payment gateway Braintree as an example of how eBay would build on its businesses such as PayPal. PayPal has been a key driver of eBay's share value, as the company vies with larger rival Amazon.com Inc, and analysts expect the unit to remain a fast-growing business as it expands into offline payments. "If you look at what is happening in the world of commerce and payments, there is a lot of action and a lot of activity," Donahoe said during a conference call. "And so we continuously assess opportunities to where we think it will be strategically and financially valuable to extend our platforms." Some investors were expecting an even larger first-quarter beat after Carl Icahn ended his campaign to force eBay to spin out PayPal earlier this month, Wedbush Securities analyst Gil Luria said. EBay's revenue rose a slightly better-than-expected 14 percent to $4.26 billion. PayPal, eBay's fastest-growing division, posted a nearly one-fifth increase in revenue. "Investors assumed that's because the results were very good and Mr. Icahn was content with what he was seeing," Luria said.